42mm stainless steel case, sapphire crystal, grand feu white enamel dial, Caliber UN-324 Self-winding movement with crown selector, unique time zone quick setting and permanent home time display, big date display in a double window, oversized seconds-hand, leather strap, folding buckle. Water resistant to 30m. 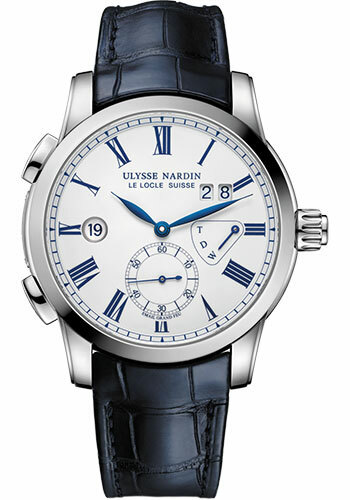 42 mm stainless steel case, sapphire crystal, grand feu enamel dial, Caliber UN-324 self-winding movement with Ulysse Nardin performance certificate, crown selector, unique time zone quick setting and permanent home time display, big date display in a double window, oversized seconds-hand, silicium technology, leather strap, folding buckle. Water resistant to 30m. 42mm stainless steel case, blue dial, caliber UN-334 self winding movement with timezone quick setting, big date, small second, approximately 48 hours of power reserve, blue alligator strap, deployment buckle. Water resistant to 30 meters.